We look at ways you can be there for a loved one who is scared of flying. For most people, booking a holiday to escape the dreary British weather is cause for celebration. For those with aviophobia (fear of flying) however, it can be a source of dread. 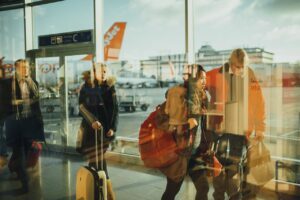 If you have a flight coming up and are travelling with someone who has a fear of flying, it can be hard to know how to help. To you, their fear may seem irrational. You may think reeling off statistics about how flying is safer than driving will help – in the majority of cases, it won’t. Phobias are often hard to understand from an outside perspective. Even if you don’t understand why your loved one finds flying so difficult, there are ways you can help support them. Telling someone with a phobia to ‘get over it’ is probably the worst thing you can do. This suggests that their feelings don’t matter and that they should be able to control their anxiety, which is often impossible. Instead look to be compassionate and acknowledge their fears. Try not to go overboard when it comes to reassurance however, as this doesn’t allow your loved one the chance to become self-confident. For most of us, airports and aeroplanes are unusual environments to be in. For those with a phobia, this sense of the ‘unknown’ can increase anxiety levels. If you can, try to familiarise your loved one with these environments. Maybe visit an airport and just go for coffee the terminal. You could also get them to look at pictures of planes and cabins to get the familiar with the way it looks. Once you are on the plane with them, try to refocus their attention away from their anxiety. Bring books, music and games on the plane with you. People with phobias tend to be introspective, causing them to overanalyse their thoughts and physical sensations. This can trigger anxiety and panic attacks. Distracting them will help to avoid this. You should also get them to focus on the reason for your trip. Try to get them excited about seeing a new place and having a new experience. There are some cases where professional help is required to overcome a phobia. There are many different options here, from cognitive behavioural therapy and ‘fear of flying’ courses to hypnotherapy. Try to encourage your loved one to reach out to someone, especially if their phobia is affecting their lives significantly. To find out more about aviophobia and how a hypnotherapist could help, please see our fear of flying page.